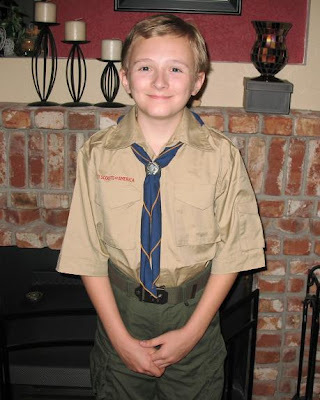 Our son recently joined Boy Scouts and just got his uniform. He's so excited about it! This is the handsomeness that we sent out into the neighborhood to sell popcorn to raise money for Scouting. Those poor neighbors didn't stand a chance! Could you say no to that polite young man? For more Wordless Wednesday pics, be sure to stop by 5 Minutes For Mom! Have a sweet day friends! Awww...that is such a great picture. I love it. I can tell you're a proud Mamma! Big I'd probably have said no to the popcorn but slipped him a twenty just because of his handsomeness size hugs to you! LOL! boy scouts are handsome too.Have one myself. No, I couldn't say no to him either! Congrats on your new Boy Scout. What a great group of people that organization is! I wouldn't be able to resist. :-) You have a very handsome young guy in that uniform, too. oh, i wouldn't refuse! Being an old Cub scout leader and the mom of a future Cub! Our son and daughter are joining the Scouts this year, too. Wishing you lots of fun!